October 7th kicks off NIGHT ONE of Sammy’s 2016 Birthday Bash! Shows continue on October 9th, 11th and then the final blowout on Sammy’s actual birthday, October 13th! Check out http://www.redrocker.com/ for ticketing information. Limited additional meal + admission tickets will be available in person at the club. Main Cards starting at 8:00 PM Cabo Time, No Cover Charge, No Reservations, First Come First Serve Basis. 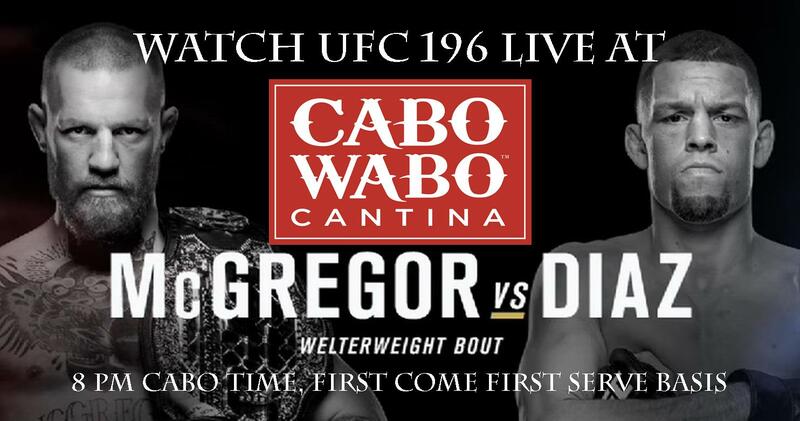 Watch the UFC 196 at Cabo Wabo Cantina! McGregor VS Diaz & Holm VS Tate!! Tonight @ 8PM!!! Watch the UFC 196 at Cabo Wabo Cantina!! Main Cards McGregor VS Diaz & Holm VS Tate!! 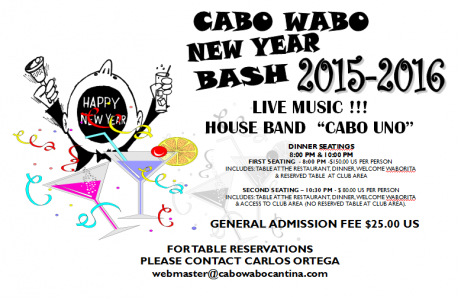 NYE at the Cabo Wabo Cantina featuring Live Music by House Band “Cabo Uno”! Two seatings – 8:00pm (SOLD OUT) and 10:00pm!